WASHINGTON — President Obama on Monday named 19 recipients of the Presidential Medal of Freedom, including the late Rep. Patsy Takemoto Mink (1927-2002). Mink was a Democratic congresswoman from Hawaii, serving a total of 12 terms, 1965-77 and 1990-2002. 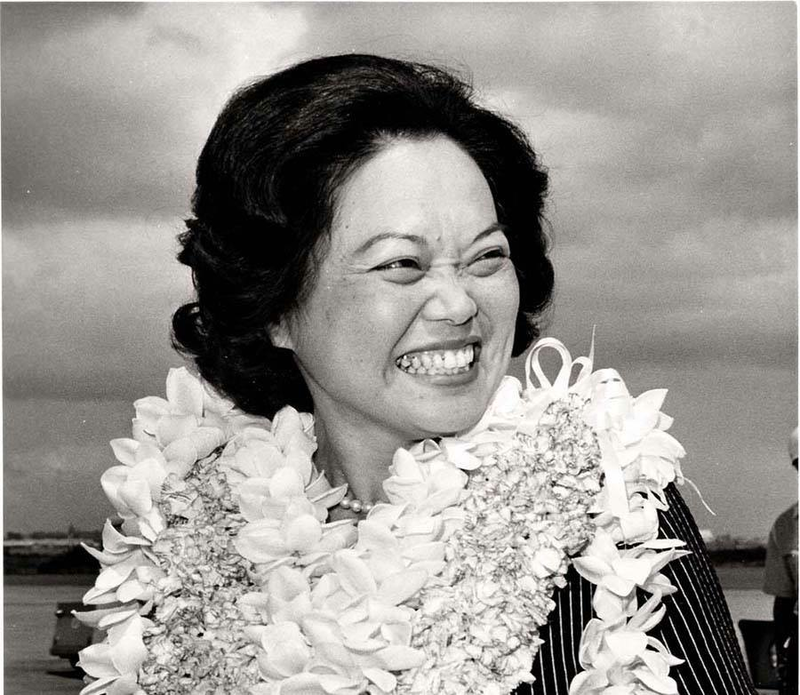 Born and raised on Maui, she became the first Japanese American female attorney in Hawaii, and served in the Hawaii territorial and state legislatures beginning in 1956. In 1964, she became the first woman of color elected to Congress. She is best known for co-authoring and championing Title IX of the Education Amendments, the federal law that protects students from gender discrimination in federally supported education programs and activities. Signed into law on June 23, 1972, the legislation has since been renamed the Patsy Takemoto Mink Equal Opportunity Education Act. Sen. Mazie Hirono: “This recognition for my friend, Patsy Mink, is well deserved and I am proud to have lent my early support to this effort. A visionary and a trailblazer, Patsy’s legacy lives on in every female student and athlete in America who’s been given a fair shot to compete in the classroom and on the playing field. Rep. Tulsi Gabbard: “Congresswoman Patsy Mink broke down long-standing barriers to create equal access to opportunities for women and girls, and courageously defied those who told her she couldn’t succeed simply because she was a woman. In the 1940s, she was denied entrance to over a dozen medical schools for being a woman, but went on to attend law school and committed her entire life to changing the status quo. “Many women and girls, and countless others who have benefited from her unwavering fight for equality, owe a debt of gratitude to Hawaii’s Patsy Mink. As a testament to the importance of her hallmark Title IX legislation, her legacy lives on in the millions of girls who today are guaranteed equal opportunities in education. Gov. Neil Abercrombie: “As a strong advocate for peace, social justice, public education, transparency in government, energy and environmental policies, Congresswoman Mink is most deserving of this honor. “Throughout her years in public service, she was a tenacious advocate for the disenfranchised and minorities, which led to a number of noteworthy accomplishments, especially her contribution to women and girls in co-authoring and championing the Title IX Amendment of the Higher Education Act in 1972. “Her work ethic was unmatched; her commitment to justice for all deep and abiding. There was simply no one like her – ever. Caring and compassionate, insightful and inspiring – she will always be in our memories as the gold standard of public service. • Alvin Ailey (posthumous), a choreographer, dancer, and the founder of the Alvin Ailey American Dance Theater, which is renowned for its inspiring performances in 71 countries on six continents since 1958. • Isabel Allende, a highly acclaimed author of 21 books that have sold 65 million copies in 35 languages. • Tom Brokaw, one of America’s most trusted and respected journalists, who served as anchor of NBC Nightly News from 1982 to 2004, and is currently a special correspondent for NBC News. • James Chaney, Andrew Goodman, and Michael Schwerner (posthumous), civil rights activists and participants in Freedom Summer, a historic voter registration drive in 1964. Their murders shocked the nation and their efforts helped to inspire many of the landmark civil rights advancements that followed. • Mildred Dresselhaus, a professor of physics and engineering at MIT and one of the most prominent physicists, materials scientists, and electrical engineers of her generation. • John Dingell, a lifelong public servant, the longest-serving member of Congress in American history, and one of the most influential legislators in history. • Ethel Kennedy, who has dedicated her life to advancing the cause of social justice, human rights, environmental protection, and poverty reduction by creating countless ripples of hope to effect change around the world. • Suzan Harjo, a writer, curator, and activist who has advocated for improving the lives of Native American peoples throughout her career. • Abner Mikva, is a dedicated public servant who has served with distinction in all three branches of government as congressman, chief judge of the U.S. Court of Appeals for the D.C. Circuit, and White House counsel for President Bill Clinton. • Edward Roybal (posthumous), the first Mexican American to be elected to the U.S. House of Representatives from California in nearly a century. He founded the Congressional Hispanic Caucus and the National Association of Latino Elected and Appointed Officials. • Charles Sifford, a professional golfer who helped to desegregate the Professional Golfers’ Association, despite harassment and death threats. • Robert Solow, one of the most widely respected economists of the past 60 years, whose research laid the groundwork for much of modern economics. • Stephen Sondheim, one of the country’s most influential theater composers and lyricists, whose work has helped define American theater. • Meryl Streep, one of the most widely known and acclaimed actors in history. • Marlo Thomas, an award-winning actress, producer, best-selling author and social activist. • Stevie Wonder, one of the world’s most gifted singer-songwriters , who has created a sound entirely his own.